When the doors shut, I just kept thinking “What is going on and what are they doing?” We were packed like sardines outside the door waiting for them to open again. Caycee Hatchette, a University of Kansas freshman from Lee Summit, got in line for Late Night around 11 a.m. Friday morning. She said there were about 200 people in line in front of her. “The atmosphere at the beginning was actually fun. We talked to the people around us and had a good time – until the doors were opened,” Hatchette said. Allen Fieldhouse has a capacity of 16,300 and some students guesstimate they saw almost 25,000 people waiting in line to get into the Fieldhouse on Friday afternoon. As the doors opened that night, students in the back of the line rushed forward cutting in front of people waiting in line for hours, and ultimately taking their spot in the Fieldhouse. Eric Turek, a University junior from California, was one of those students. Turek got to the Fieldhouse a little before 3 p.m. His friends arrived shortly before 5 p.m. The doors to Allen Filedhouse were scheduled to open at 5:30 p.m. A few minutes before the doors opened Turek said he saw about 30 people begin to race toward the door. They were in a bird-like formation similar to what you would see in the sky. People standing at the back saw this and began to copy. Soon hundreds were all rushing toward the doors cutting people in front of them. “A rush surged through me, and I realized that if I didn’t run, I wouldn’t have made it,” Turek said. 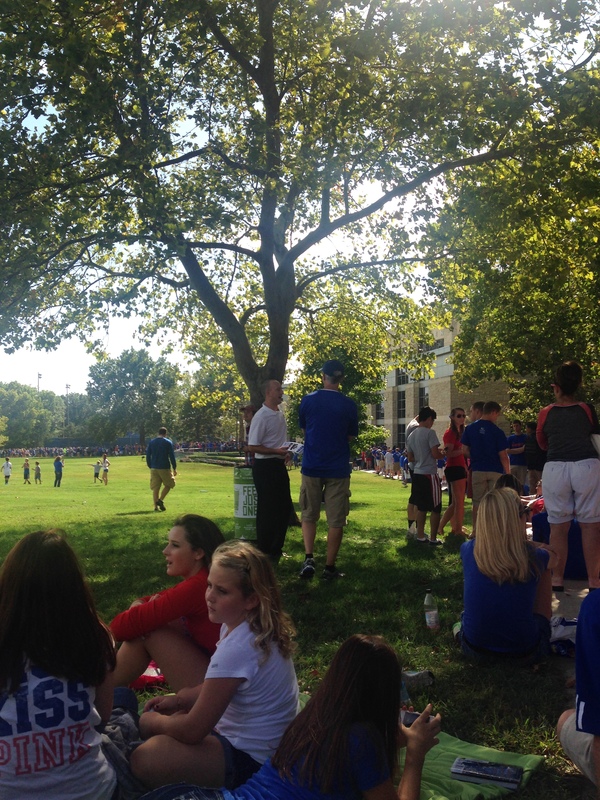 A University Athletics staff member describes the experience from the inside as a scary bullrush of people. He said the University had cattle guards to direct the lines, but people jumped or toppled them to get inside. Small numbers of tickets to Late Night were sold for reserved sections, but the majority of the tickets were given out at the doors as people entered. An exact number of 16,300 tickets including reserved tickets were to be given out in order to control capacity. However, many people who rushed in pushed University staff out of the way limiting their ability to know how many people came inside. Abbey Johnson, a senior from Vermont, was one of the thousands who was still waiting in line when the doors shut. She describes the crowd around her as angry, restless and upset. The line was more like a mob of people shoved up against each other back to front. She said she was standing next to a family with small children who had waited in line all day and didn’t want to leave in the small chance they might get let in. 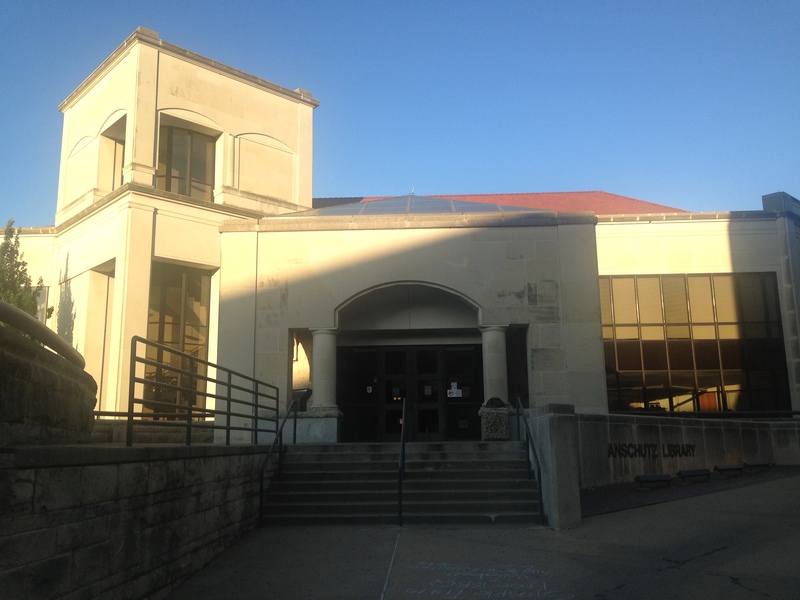 After waiting for 30 to 45 minutes after the doors closed, students were alerted not by KU Athletics staff, but by a tweet made by the official KU Athletics Twitter account. Anschutz library, or as most students call it, “Club Schutz” is one of the most popular places to study on campus. Walk through the double doors and you are greeted by a friendly smile from the help desk. Sitting straight ahead of you, you will find the computer area. That coffee you smell comes from the mini-café to your left. Just around the corner of the café is “TanSchutz,” where students can lounge in front of large uncovered windows with the sun beaming down on their faces while they study or sometimes even catch a snooze. Anschutz, as you can see, is much more than your average university library. It is so much more. Anschutz first opened its doors on October 7, 1989, when it was formally presented to Chancellor Budig. A dedication ceremony was held where Philip Anschutz spoke on behalf of the Anschutz family. Philip Anschutz, a KU alumnus, who is the founder of AEG (Anschutz Entertainment Group), graduated from KU in 1961 with a degree in business administration. Anschutz and his wife Nancy donated $6.5 million dollars to the $13.9 million construction of the library. Because of his generous contribution, Chancellor Budig allowed Anschutz the honor of naming the building. Anschutz decided on the “Marian and Fred Anschutz Science Library” to honor both of his parents, who were also big donors to the university. Robert Szavo, the Anschutz Operations Manager has been working at Anschutz for 12 years. His favorite part of his job is the people. When asked to describe the building, he described it as one of the more modern buildings on campus. Anschutz Library has five stories, 92,000 square feet, a limestone exterior and a red-tiled roof. There are many large windows surrounding the building shining light onto the main floor. Anschutz is also the only library on campus that is open 24 hours Sunday through Friday to give students a place to go on their own schedule. Not only is it a place for students to study, but with “group study” tables it can be a place to socialize with friends while procrastinating on homework, or a place to people watch and observe your surroundings. Anschutz is so much more than your typical library. At the dedication ceremony for the building, Chancellor Budig said that Anschutz library “represents our commitment to the future.” As a student almost 24 years later, I am seeing that commitment continue, and hope that someday when my children come here they will appreciate it just as I do now.